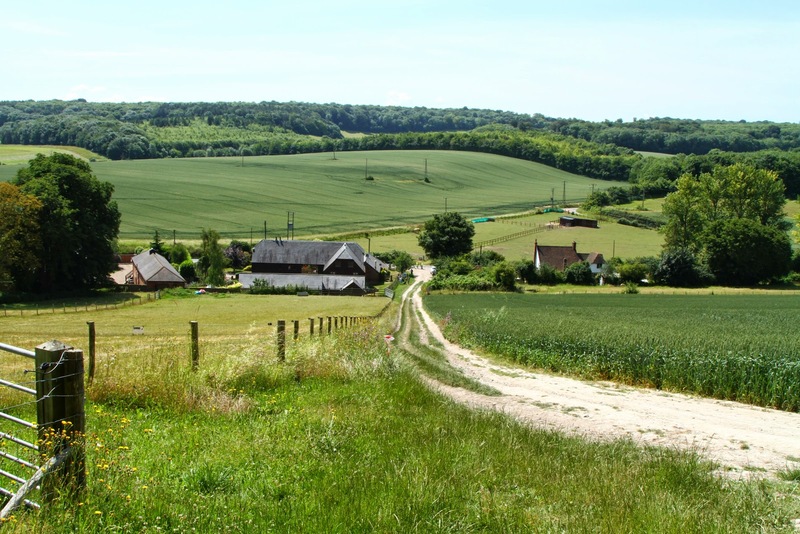 The North Downs Run is a hilly, 30 kilometre, mixed terrain trail race that has been in the Kent race calendar since its first running in 1984. The course has been modified a few times over the years and the start/finish area moved to provide better facilities. It is now organised by Istead and Ifield Harriers, who have been awarded a Gold Grading for Race Management by the British Association of Road Racing (BARR). I entered this race largely due to the sheer amount of praise it was receiving from my running friends. I could not find anyone that had a single bad word to say about the event. 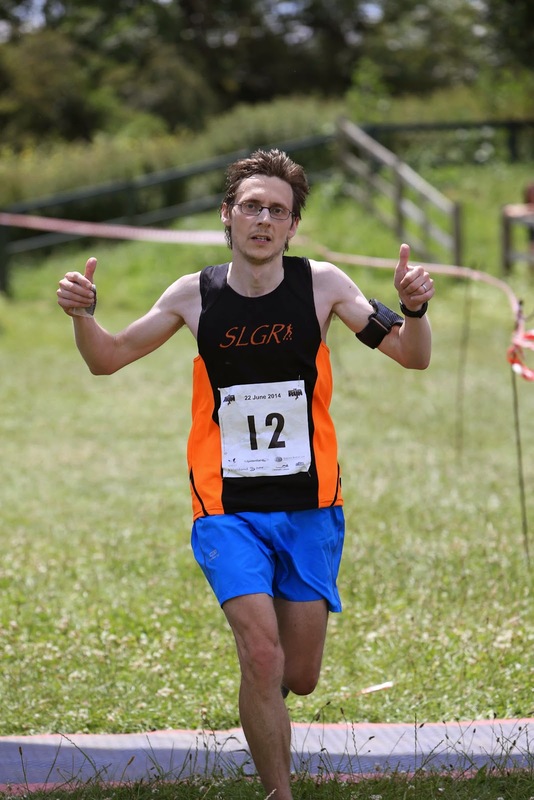 It also features quite heavily in various 'best UK trail races' articles. I had promised myself that I would do something more challenging this year, so when the entries opened for the 2014 event, I signed up. I paid the full unattached price which was £24, if I had been an affiliated runner at the time I would have paid £22. 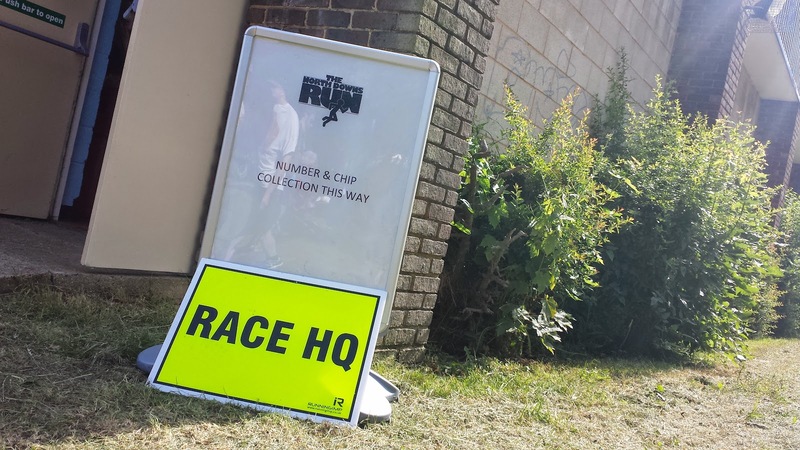 In the months and weeks leading up to the event, the North Downs Run Facebook and Twitter accounts were very active and kept me fully engaged with what was going on, from latest reports on course conditions to offers of training runs on parts of the course. As the race neared it suddenly dawned on me that in the time since I had signed up, I had become part of the So Let's Go Running running club, so I asked if my details could be updated, which they did almost instantly. The email communication containing race information was also superb. Some training advice I had received beforehand was to treat this race like a marathon. In the end I didn't manage to run the full 30 kilometres in training let alone anything more, but I did focus on lots of back-to-back running which I think worked fairly well in the end. The idea was that the accumulation of fatigue in my legs would help to prepare me for the latter parts of the race when the legs are suffering. The furthest I ran in one single training run in the build up to the race was around 25.5 kilometres. 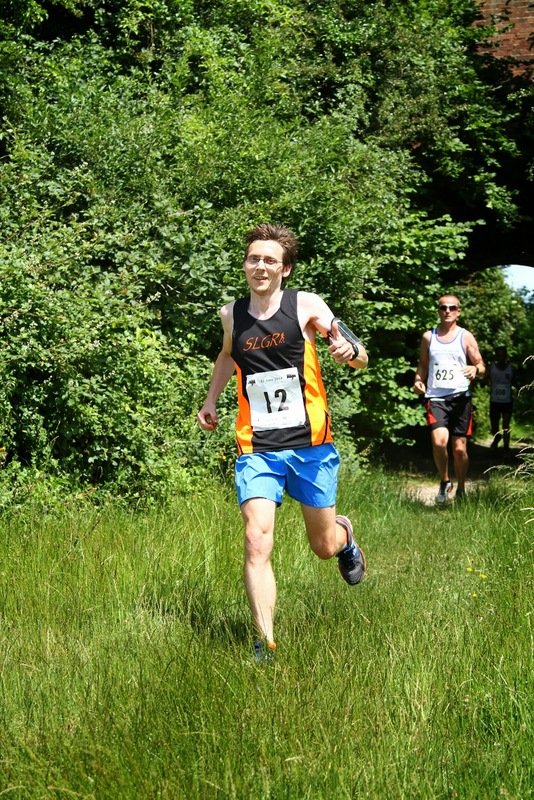 I also ran the Vigo Runners Valentine 10 mile trail race (similar terrain) and a few half-marathons (Headcorn / Paddock Wood / Tivoli) in the months beforehand. Onto the day itself, and the race start time was set for 10.30am. This was quite handy as I had been up late the night before at a wedding reception and the chance to have a lie-in was appreciated. As the race is held in June there is always the possibility that it could turn out to be a scorcher weatherwise. And that's what we got - unbroken sunshine and temperatures well up into the twenties. So the scene was set - 30 kilometres across a very hilly route which is mostly off-road and with the heat to deal with as well. The race HQ, car parking, start, finish, and toilets are all located within the grounds of the Cascades Leisure Centre, in Gravesend. Marshals were on hand to assist with getting the cars parked up sensibly and we were given a race programme upon entering the the grounds. It was nice to see the runners' names printed inside. Once parked up I headed into the race HQ, which was in a sports hall, to collect my number (12). The race was timed by chip and the timing chip itself was embedded into the race number. The toilets, 10 portaloos, were just outside on the grass and although they didn't look like enough, they seemed to handle the needs of the 559 runners quite well. On the occasions I used them, I didn't have to wait for any longer than a few minutes. There were also toilets inside the leisure centre. I headed back over to the car to make the final decision on footwear - there had been no significant rain during the past couple of weeks and the course was bone dry. With this in mind, I decided to go for my New Balance 1080v3 road shoes. As 10.30 approached I got into position at the start area. 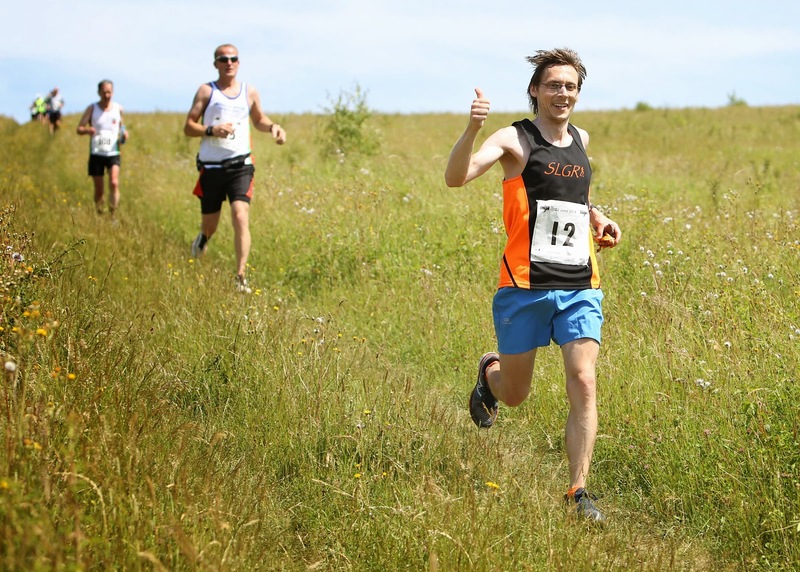 I had made the decision to start very conservatively and slowly ease into the race - effectively using the first few kilometres as my warm up whilst chatting to fellow North Downs Run debutant, Daniel (286). The start was captured on video from the air. My main goals were to finish the race in one piece, and to enjoy it and the wonderful countryside that we would shortly be running through. I tried to avoid setting a time goal, but after thinking about it, I thought somewhere around two-and-a-half hours sounded reasonable. It's difficult to remember every detail of the course, but I'll do my best to run through it as best as I remember. 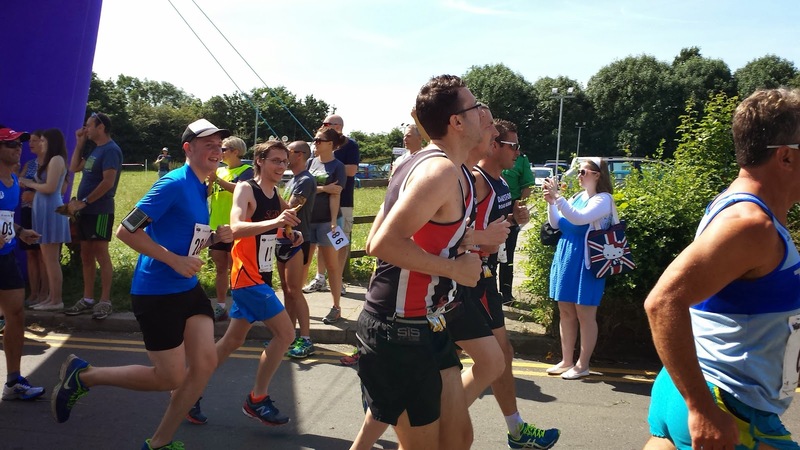 The first 3 kilometres of the race are reasonably flat and include a lap around the sports fields behind the leisure centre before passing back through the start line, across a golf course and then out into the stunning Kent countryside. The route then passes through the first of many big dips, a valley I suppose, and as you head down into the valley, you can see a single-file line of runners stretching all the way across. This is a great sight but being single file, if you are out of position (as I was following my relaxed start) you'll find that you have no choice but to simply plod along behind the runner in front at whatever pace they are running at. 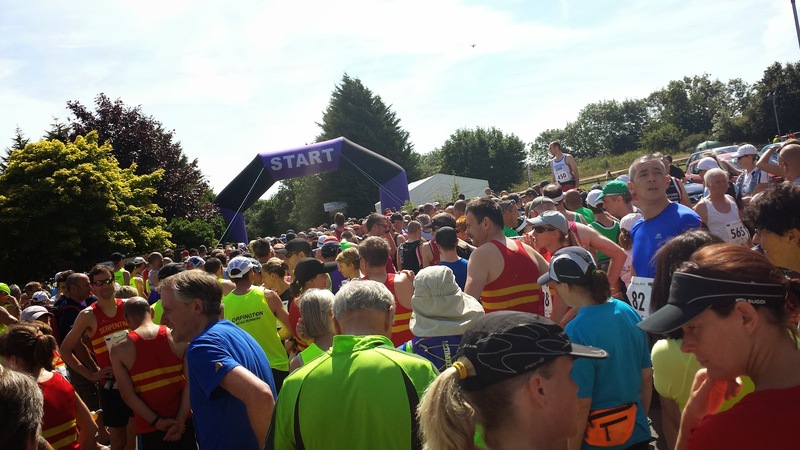 The race takes the runners south around the eastern side of Shorne Woods and then at around the 7 kilometre point, crosses the A2. It is then uphill for the next mile before starting the decent to the lowest point of the course, Lower Bush. The next 6km takes the runners from the lowest point of the course (12 metres) right up to the highest point of the course (175 metres), which is Holly Hill. Being fairly early on in the race still, this section wasn't too taxing on my legs and I generally felt fine. Meanwhile, back at Race HQ, my daughter was getting ready to run the North Downs Fun Run. There were two races for children; one for under 8s and one for over 8s. Her race start time was 11.15. The children's races were approximately 1.4km in length and followed the same route as the beginning of the 30k race. She had entered on-the-day for £2. There were a few volunteers making sure the children didn't get lost en-route. She really enjoyed the race and she finished in 21st position out of 23 children, in a time of 11.07. That works out at 7.57 per kilometre or 12.47 per mile pace. Not bad for a three-year-old. Back over at the main race. The sun was beating down and runners starting to feel it. The water stations were placed approximately every 5 kilometres, so there were plenty of opportunities to take on extra fluids. I didn't carry any water of my own so I slowed down and took a drink at every station. In retrospect, I probably didn't quite take on enough water throughout the race, so I will try to learn from this. As far as fueling goes, it had been on playing my mind and I decided to start the race with a banana in one hand and a bag of sultanas sprinkled with salt in the other. I ate the banana slowly between the 8 and 10 kilometre points. The sultanas got dipped into towards the latter stages. Following my slow start, I eventually settled into my preferred pace. However, I was now over two minutes adrift of a potential sub 2 hour, 30 minute finish time. I reached the halfway point (15km) in, I think, 1 hour and 17 minutes. Shortly after this was the water station that gave runners the option of having a halfway beer. From here the course was largely downhill until reaching the next water station at 19.5 kilometres. After this, one of the most anticipated sections of the course awaits - Cricket Pitch Hill. Here the course goes downhill through another valley which features a cricket pitch slap bang in the middle of it. In some years the surrounding fields are covered in poppies - we weren't quite so lucky this year. During the tough uphill climb out of the valley, I found myself stuck behind another runner on a single track path with no possibility of overtaking. Whether I ran or walked, I was still moving at the same pace as him, so I took the opportunity to save a bit of energy (also helped limit the damage to my quads and calves) by walking. Throughout the course there were plenty of gates to pass through and stiles to climb over. They were mostly accompanied by marshals, who did a fabulous job on the day and I'd like to pass on my thanks to them all. There were even occasions where the marshals cheered 'So Let's Go Running' as I passed, and this is despite the front of my vest only saying SLGR - So they were clearly all very well informed. The official race photographer was Jodi Hanagan (jodihanaganphotography.com), who is definitely worth checking out if you are looking to hire a photographer. She was accompanied by her able assistant, Mr SLGR himself - Brian Page. Between them they have produced an amazing collection of photos of the day. It was great to see them at various points around the course kitted out in their SLGR tops, it certainly gave me a well needed boost. I felt great throughout the next few kilometres and I reached the half-marathon point in 1 hour and 47 minutes. That left around 43 minutes to complete the last 9 kilometres and still come in under 2 hours and 30 minutes. I was flying through the next few kilometres and was still feeling great. As I arrived in Cobham via the St. Mary Magdalene churchyard, I passed The Leather Bottle pub (much frequented by Charles Dickens so I hear) and someone shouted something like 'Go Steve!' - I'm not sure who it was that shouted or if it was meant for me, but I waved in appreciation. Again it was a well received boost and I assume it was one of the SLGR gang, so thank you! Before too long I had arrived at the point where the course goes back across the A2 motorway. There were now around 6 kilometres left to run. However, they were to be the hardest 6 kilometres of my life. The route entered the western side of Shorne Country Park shortly after crossing the A2 and this is where the final uphill sections were found. To just simply say that this section was hard would be an understatement. I was reduced to walking at multiple points during this point as the uphills are (or felt) severe. Even running them on fresh legs would have been challenging. Once through this section, the course then became familiar as it rejoined parts of the beginning of the race which lead back towards the Cascades Leisure Centre. My legs, partly recovered from the Shorne Woods hills, allowed me to pick up the pace as I ran down into the valley, but as I neared the top of the opposite side, my right calf cramped forcing me to slow and then come to a complete stop to give it a little stretch. Going back through the golf course was quite possibly the most agonising section of running I have ever done. It wasn't helped by the sun beating down, by now it was around 28 degrees. I felt physically sick at this point. Although I had hydrated before the race and took drinks at every drinks station, I think I was now very dehydrated. With the finish line almost in sight, I saw Brian again who gave a cheer and let me know how far away the finish was (150 metres). Shortly after that I got a high-five from the event director from Great Lines parkrun, Tony Giles, who had been doing a wonderful job marshaling. A short section through some trees and the finish line was right in front of me. Nothing could have been a more welcome sight than that lovely, big, purple, inflatable arch. Once over the line (click here to see the video), I was given a bottle of water, my commemorative technical t-shirt, my goody bag and of course, my medal! I headed onwards not wanting to stop moving. I knew my legs were going to seize up badly if I stopped. But I did stop, and they did start to seize up. 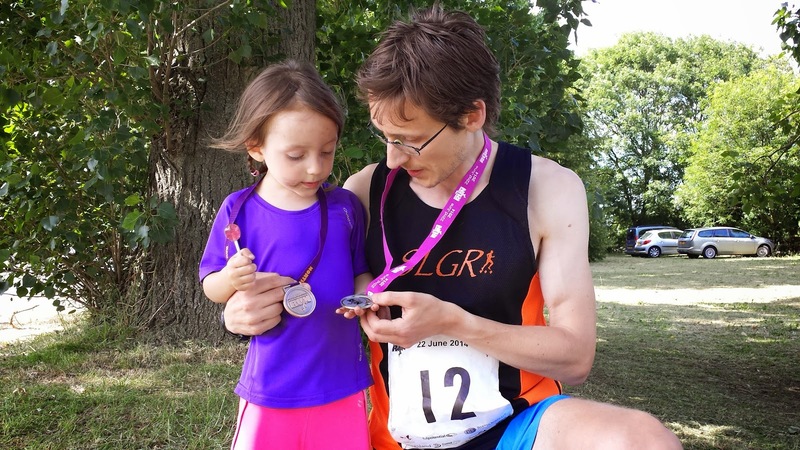 So I started to walk around, and then my daughter joined me to show me her medal and tell me about her race, which she really enjoyed. I downed the water and then popped into the refreshments gazebo. On offer were all sorts of cakes (including vegan options), tea, coffee, water and squash. I joined the family in their spot on the grass in the finishing area and, as I didn't feel too great, laid down to the pleasant sounds of a folky-type live band that had been hired to play at the finish area. This didn't last for long as I felt sick again. I tried to stand up but my head was now spinning. The best position for me seemed to be kneeling down, and it was great to see each of my running friends from Riddlesdown parkrun, SLGR, and elsewhere as they crossed the line. Some joined us for a bit of post race analysis, which is always great fun! I carried on drinking - more water, some squash, some apple juice; anything I could get my hands on. The official times had been printed and put up on the notice board in the middle of the finish area. The team results (we were 28th male team) were posted online later on. I found my name and saw that I finished in 63rd position (just outside the top ten percent) and my official chip finishing time was 2 hours, 32 minutes and 31 seconds. I had originally thought that I was a minute faster and had been telling everyone I had finished in 2 hours and 31 minutes. I blame the condition I was in for making me unable to read the timer at the finish line as I passed it. Anyway with that resolved, I headed back to my spot on the grass to drink some more and eat the crisps that were in my goody bag for a bit of extra salt. I tracked the run using the Strava app on my phone, which you can view if you are interested in that kind of thing. It can sometimes be slightly out and this was one of those times - my phone recorded the course as 31 kilometres. I've noticed that the margin of error with the phone/app can sometimes be around 3%, so it is no surprise. Just ignore that particular detail if you're checking out the data. I know that some friends' data came out closer to the true distance. After about an hour-and-a-half of chatting and recovering at the finish area, I finally stopped feeling dizzy and was able to head off home, but not before having a ride on the miniature steam railway. The day had been fantastic. It was obvious now why the race had been recognised with that BARR award. The event was absolutely flawless in every way. This is definitely a race that I'd enter again (and again), and now that I have run it once, I have a time to beat next time!